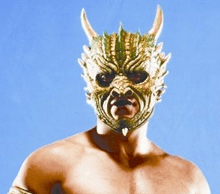 Who are Fenix, Drago, and Pentagon Jr.? FENIX: 23 years old, from Mexico City. Tecnico greatly influenced by Japanese juniors wrestling; it was his dream to one day wrestle in Japan and he broke down in tears after his first match there. Joined AAA in 2011 and quickly rose to the midlevel. 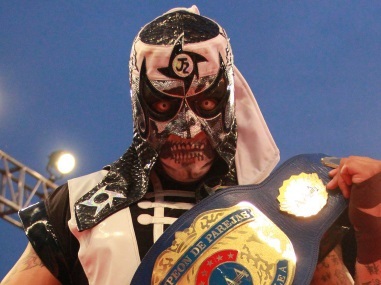 Won the new AAA Fusion championship in 2013 with the idea of making him the centerpiece of an AAA satellite promotion based on exciting young luchadors in small venues. (That sounds vaguely familiar.) Fenix is the quintessential AAA young guy: clearly anointed by the promotion as a next big star but left adrift in months as a time. The latest idea in AAA itself is to make Myzteziz his veteran mentor, but his success in Lucha Underground could reshape his future again. Deep Cut: Fenix vs Dinamic Black, 2013-03-21 – you have to take Fenix out of AAA for him to actually get singles matches, and his highest profile one was against IWRG’s rising star (at the time) Dinamic Black. What starts as a friendly meeting of two high flyers who generally do a US style derails a bit after a miscommunication, and then completely goes off the rails when both guys angrily decide to stop with the lucha libre and delve into something else. This is not a good match at points, but it turns into quite a fight. DRAGO: 39 years old from from Mexico City. AAA 2000s utility player who has spent time as a Michael Jackson themed luchador, a skateboarding kid, and a cat (sponsored by a battery company.) Lived on the fringe of the roster until being cast as new gimmick Drago. The character is one of the bigger design successes of AAA’s current era; Drago’s not ben involved in a lot, but he’s popular and looked much more confident in the ring with the promotion behind him. His unique look – that weird tongue! – keeps him interesting even when he doesn’t win. Recommended match: Angélico, Drago, Jack Evans vs Carta Brava Jr., Eterno, Steve Pain, 2013-06-14 – Drago’s AAA title matches have just been okay (usually for other people involved in there), but he’s been involved in a lot of good trios match. This is mostly a random match, with Drago teaming with the current tag champions against the Anarquia’s Eterno & Super Pain and random eviledoer Carta Brava, but it’s a good exhibition for all six guys. Deep Cut: Atomic Boy, Gato Eveready, Pimpinela Escarlata vs Pasion Kristal, Polvo de Estrellas, Yuriko, 2009-07-17 – before he was Drago, he was Gato Eveready, a battery sponsored cat with an exotico admirer. That was a real sentence. Pimpinela’s coming to Lucha Underground soon, might as well see her too. PENTAGON JR.: 29 years old, from Mexico City. Came in to AAA around 2011 and wrestled Fenix many times and had great matches all the time, which springboard both into bigger positions in the company. Carries himself like an ax murder and looks the part. Appears to have gone this year from a guy who’s used to make others to a guy AAA wants to make himself, it may be just a matter of time before he picks up his first big mask win. Pentagon can do all the crazy moves the other two can, but he really shines at holding a match together and making a high flyer look good. He probably won’t be the public star as the other two right away, but Pentagon’s the guy close watching fans will appreciate the most. Recommended match: Australian Suicide vs Pentagón Jr., 2014-05-10 – Pentagon Jr. hsa spend most of the year torturing a kid from Australia. Australian Suicide finally gets some revenge in their first match, though indications are it won’t be their last.